Okay, so I won't be around long enough to do an actual post today, so how about some nice bottle pictures? All of these are things I'm trying to swatch for upcoming posts. Some are new, some are old, some are harder to find. Personally, I love looking at bottle pictures... maybe I should do some more often! i can't wait for your swatches!! Ah Scrangie! I almost bought those LeChat Disco Tech's this morning. I'm partial to bottle pics myself, especially with glitters. There is nothing more satisfying than a fabulous glitter packed bottle pic. Serious bottle pr0n. Oh, its MissHavisham by the way. (Jen in real life) And those Goldies too..I'm peeved they don't make polish anymore, the ones I bought at Marshalls have top billing atop the helmer due to incredible cuteness. And I'm not usually a sucker for cute. Give me a KO bottle any day...but the Goldies are irresistible. OMG is that a BLACK French tip pen?? :) I love bottle pix too, and these are all delicious! Oh dear sweet Jesus!! I can't wait for swatches!! Yours are always the best, and these look like the kind that I'd see at the store and stand there forever trying to decide if they would look as cute as they look in the bottle! Ooooh, you're right looking at bottles is so much fun! I love "for nasty nails" eww. You have a lot. Where did you get those LeChat polishes from? There is one website I know of but they don't have pics. of most of them. Can't wait for the swatches! That Eyeco pic. cracks me up. 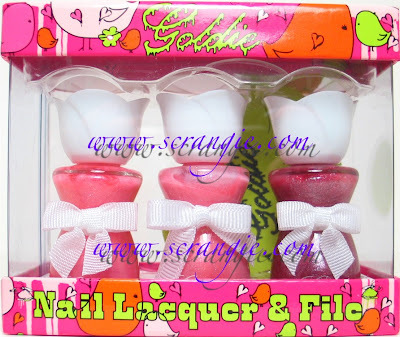 For nasty nails?? oh I can't wait to see the Eyeko polishes. Espec the disco one! Have a good weekend Scrangie! I'm very interested in seeing and reading about all these special polishes. I've never seen any of those. I must be living under a rock. Those Goldie bottles are adorable. They have nice figures. I love scented nail polish! I am so curious about the set from Claire's. Glitter is a profound reason to wake up in the morning. 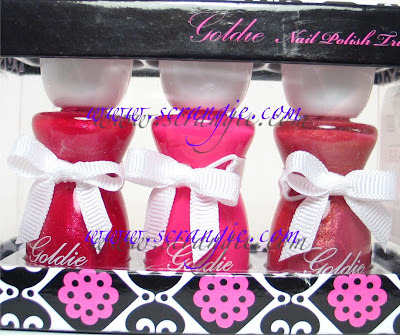 Hi Scrangie, please show us those Konad Princess polishes very soon! I am making a Konad order in a week or so, and would love to see those colors swatched. (I might want to add a few to my order) Which color is the first bottle? Jungle Green? Looks like an interesting selection of colors. The Eyeko polish bottles were rather amusing. However, I can't say I agree with the the "Vampy Polish" being for nasty nails. When someone says "nasty nails", I think dirty and fungus infected. I cant wait for the konad colors!! Inbal, they're all so pretty! Mary, yay, I love them all! Mama Jen, you do, they're soooo good! MariahGem, haha, awwe! Thank you! That makes me really happy! Cacauate, the Disco is my favorite one! Lucy, they're really nice and opaque and such cool colors! Nail Fanatic, I hope I can get them all posted soon! Anonymous, I believe it is Jungle Green :) Will do these soon, I'm going to be doing a lot of Konad stuff soon! Patricia, those were the only ones I had trouble with! The other ones were great, but the pink and blue were really difficult to apply. I can't wait to see those aah! The last sets of polish are such cute bottles. Squeal! I *heart* those Konad colors! Can't wait to see the swatches! Oh That's something to look forward to:D have a great Sunday!!! how/whe do you take time to swatch, photo, edit photos, & post!? oh yeah....all AFTER waiting fo rthe nails to dry! Hey Scrangie :) I too am excited to see all these swatched and this is a HUGE tease LOL I also had another question about which brand of glass nail file you recommend. Any suggestion would be appreciated. Have a great rest of the weekend!! I'm about to order some Zoya, and I wonder if Zoya Indigo and Zoya Ibiza (from Dare) are dupes? I already have Indigo but haven't tried it on yet. Do you think I should get Ibiza to or are they too alike? Thank you, your blog is great! i love those konad colors - are they new?